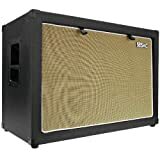 Home / Music / Review: Seismic Audio Luke 2×12 Cabinet (Can An Empty Cab Be Filled With Goodness? I was in the market for an empty 2×12 cabinet. Think of all the brands around who’d offer such things, and you’d probably think of Marshall, and probably Laney, maybe Orange too. I was specifically looking for something cheap and cheerful because it was for a project. If you’re a newbie to what the term “project” means for guitarists, it means mashing parts together and bodging together something that you don’t feel anybody else has created for. To minimize risk in case your creation goes wrong, it’s predominantly made with the cheapest of parts. Projects FTW! I wanted cheap. but I still wanted something relatively decent – if this project didn’t work out I might want to repurpose it for something else. I hit up the usual eBay and Craigslist, but all the 2×12 cabs within my budget were either really beat up, or too far away to collect. I decided to see if Amazon had any ideas. Throughout the first page of search results, was a brand called Seismic Audio. I had never heard of them before, but they looked like they were the right price, so I did some more digging. They’re essentially a brand set up by a guy called Steve who wanted to offer musicians good gear, at affordable prices. Very noble indeed. Of the range of cabs available, this is the one that caught my eye. Let’s not pretend that it’s not the color. Orange, like that better-known brand, but a different shade of orange, so they can’t be sued. Good work, Steve! If the orange color is a bit too orange for you, they have a bunch of other options available. That covers the specs: there’s only so much to be said for an empty cabinet! At the heart of this cabinet is the birch plywood. It’s about an inch thick. It’s a common enough material in guitar cab construction. Hey, if something isn’t broke, don’t fix it. I’ve mentioned – what am I saying? You’ve obviously seen! – the orange covering. That’s tolex. Again, a standard material in amplifier and cabinet construction. Cheap and cheerful. It’s got a few other bits around that bring the whole package together. I’m a fan of the chunky looking metal corners on it. The chunky plastic feet will, of course, allow you to put it back in the same place every time you move it if you store it on the carpet, as well as keeping the whole bottom from dragging on the floor. I jest of course: they’ll help retain the resonance of the amp when you have it loaded and loud. I think the front grille is pretty cool: it’s designed to just pop in and pop out as you need. It’s got solid handles on either side too. You might be thinking “What can you say about the construction of a box?” and for the most part, you would be right! But, I feel like it’s important to highlight when a lesser known brand presents some high quality, well-constructed products. I worked my way around this cab giving everything a good poke and stopped short of kicking it, whacking it with a hammer, or setting it on fire. I should also point out that the appropriateness of the construction will also be relevant to what you plan on using it for. As this is for a project, that may simply end up in a dumpster, I can’t tell if this will actually survive the rigors of a gigging musician. But, if I was to hazard a guess, I’d say it would be fine. The metal corners are very reassuring – much better than the plastic ones you’d find on some better-known brands. The inputs at the back of the speaker feel a little bit flimsy – I feel like you’d need to be at least a bit careful plugging and unplugging from it, but for my project, it’s not that much of a concern. I love being surprised by brands that I’ve never heard of or used before, and generally seeking out a brand with an ethos that favors musicians, and tries to act in their favor, rather than brands that crank out products that are barely attainable due to the cost of just having that brand on it. Seismic Audio have certainly hit the spot with that. Obviously, it remains to be seen whether or not my project will pan out. In case you’re wondering, the project is having both a guitar amp and a bass amp in a single cab, with a dedicated speaker for each. Previous Review: Smokey Amp – should anybody use these silly looking things?